The long-discussed Galleria project received a fresh injection of life today after Council threw its support behind a phased approach that would see the $1 billion project constructed through 2020. The item was up at Executive Committee again after last year’s request by Council to find a way to lower the risk to the City. The Galleria project consists of the same components today as it did then: four performing arts theatres (1600 seat theatre, 650 seat theatre/concert hall, 200 seat theatre, 200 seat recital hall); the relocation of the University of Alberta’s School of Music, Department of Art & Design, and one other department; construction of an office tower; development of a covered public galleria; and commercial and retail opportunities. The difference is that now it’s not an all or nothing proposition. Today’s decision by Council to endorse a phased approach means the project backers can seek funding from the other orders of government. It also means in theory that certain triggers must be met before the City needs to spend any money, the first of which is agreeing to a memorandum of understanding in September and giving final approval to the City’s financial contribution. So how much would the City be on the hook for? It sounds like any City money would come with strings attached too: “The release of city funds would be dependent on EDAC achieving certain milestones including the securing of a tenant in commercial/residential development with income sufficient to cover the capital and operating commitments of the Foundation.” That’s a much better approach than they took with the arena. For now they’ve approved $7.5 million for the pedway between Churchill LRT Station and the Royal Alberta Museum. As I mentioned last year, I’m fine with the land acquisitions the City would be making. That’s probably a wise investment whether the Galleria project goes ahead or not. But there are still too many questions outstanding for me to support this project. The Galleria project is only going to move forward if funding from the other orders of government can be secured, and that’s far from guaranteed. We saw absolutely zero interest from the PCs in supporting the project, even with Irv & Dianne Kipnes as donors, so I don’t see why the NDP would be any more likely to support it. The Provincial government has stuck to its hard line against funding the downtown arena, and I’d be surprised to see them all of a sudden come to the table on the Galleria. On the federal side, Mayor Iveson has said that Council has received “mixed signals” and that he’d be surprised if the project could secure any federal funding at all. It has not been easy to get money out of Ottawa. Council had to agree to a P3 in order to get federal funding for the LRT, for instance. Furthermore, the reality is that the City and specifically Council is going to have to go to bat for the project if the Province or the Feds are going to pony up anything at all. And that begs the question, is this really the project you want to burn important political capital on? Is this more important than the City Charter, LRT, poverty elimination, or any of the other significant priorities Edmonton has? Crickets. That’s what we’ve heard from most arts organizations about the Galleria project, at least publicly. Privately many have argued against the project, but the Kipnes are powerful enemies to attract. A purpose-built opera house would undoubtedly be a good thing for the Edmonton Opera. It’s probably the most expensive art form in the world. For example, the Jubilee is effectively dark for about 90 nights a year to stage just 3 or 4 opera performances because of the construction and rehearsal time that each one takes. That’s a lot of lost revenue when you consider that events like “The Book of Mormon” can arrive and be setup in a day and will nearly always sell out. Without hearing from other organizations, how can we be sure the proposed four theatres would meet the need that exists in the arts community? How much of the new Galleria space would be open and available to other arts organizations? How often would it be unavailable thanks to either opera or University of Alberta use? What costs or other requirements would go along with use? Perhaps those details are yet to be finalized and that’s why it is difficult for arts organizations to decide whether or not to support the project. But it’s not a good sign that the arts community at large has been so quiet on the project. 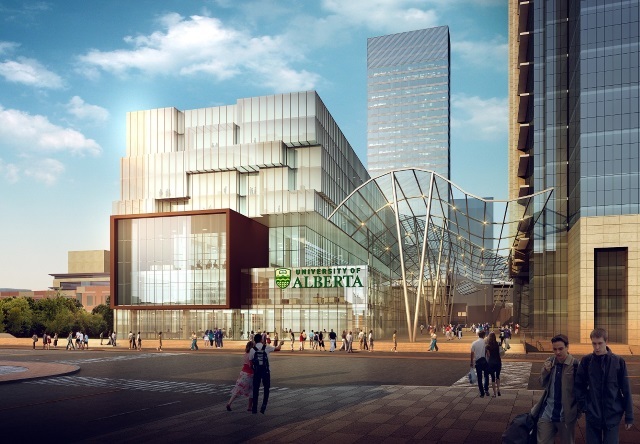 With MacEwan and NorQuest consolidating their campuses downtown, I can understand that perhaps the University of Alberta feels a little left out, but breaking up its own campus doesn’t seem like a wise move. For years it was pretty clear in all U of A long range plans that a downtown campus was not in the best interests of the university or its students. The South Campus vision was the preferred approach, allowing for a more connected campus. There has been some vague lip service paid to the fact that being connected via the LRT to all other post secondary institutions would be a beneficial thing, but as soon as the Metro Line opens we’ll already have that. No need for a new campus. Innovation doesn’t seem to be happening by segregation. The most interesting and powerful ideas that are changing the world are coming from interdisciplinary efforts. Why separate the arts from the science and engineering part of the university? Furthermore, what impact would a downtown arts campus for the U of A have on MacEwan’s new Centre for Arts and Culture? Does it make sense to have two arts campuses so close to one another? Look up and you see cranes. Look around on ground level and you’ll see a bunch of empty space. We’re coming up on four years since the EPCOR Tower opened, the first new office tower built downtown since 1990. Originally known as “Station Lands Tower A”, the building still to this day has empty, unused space (such as the entire 16th floor where the recent downtown event was held). The other buildings that were slated to be part of the Station Lands development have never materialized. The old EPCOR tower, rebranded First & Jasper, still has plenty of empty space, such as most of the ground level commercial. Even Edmonton’s premier downtown street, 104 Street, is home to its share of vacancies. The old Carbon space near 102 Avenue remains empty as does the old Sobey’s on the corner of Jasper Avenue, one of the most visible – and in theory attractive – locations in all of Edmonton. All of this space is empty today, before development has really gotten underway. What will happen when the City of Edmonton offices consolidate into the new tower? Scotia Place, HSBC, Century Place, and other buildings are going to have a lot of vacancies. What about when Stantec consolidates into its new tower? All of its existing offices will need new tenants. What happens to City Centre when the new hotel and theatre open in the arena district? It’s already struggling to keep retailers. In fact, a Cushman and Wakefield report suggests that by the end of 2017, Edmonton’s office vacancy rate could reach 17%, the highest in the country. I’m all for getting rid of additional parking lots, but where’s the demand for yet another office tower? Especially one that needs to generate revenue to help fund the project. So far the Katz Group has been publicly supportive of the Galleria but I have no doubt that would change if their significant real estate investments came under threat. There’s simply too much money at stake. The arena deal is done and for better or worse the Downtown CRL depends on it. So as taxpayers, we need that project to be successful. Does it really make sense to build a competitive project right next door? Another office tower to fill, with additional retail spaces that need to attract patrons? Proponents of the Galleria would argue that the project will drive significant additional traffic to the area but I find their estimates unrealistic and I’ve not see any new data that would change my mind. Plus we’d have yet another big, open public space to program or have sit empty. Is there really a need for Churchill Square, the EAD square, and a public galleria? I completely understand that when someone comes forward with $50 million as the philanthropists behind the Galleria project have, there’s a desire on the part of Council to leverage that money. Acquiring funding for projects is hard and having private money brought to the table is a huge help and doesn’t happen every day. But just because you come to the table with money doesn’t mean that your project should go ahead. 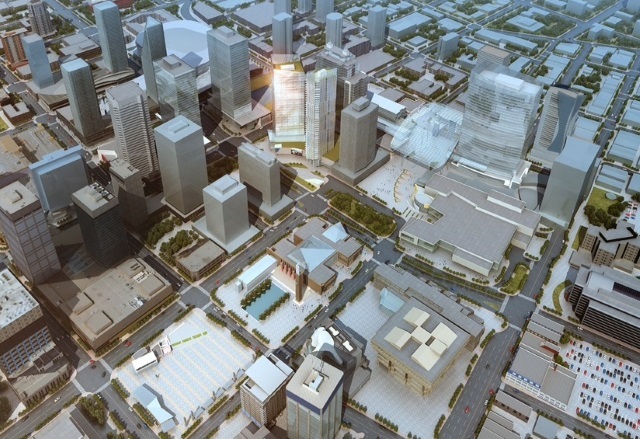 Council needs to decide not only if the Galleria itself is a good project, but whether it is going to bring a positive, net benefit to downtown and to Edmonton as a whole. Does Edmonton need the Galleria right now? Will it have a positive impact, without negatively impacting the other major projects we have underway? With so many big questions still unanswered, I remain unconvinced that Edmonton should support the Galleria project.